traditional Thai massage can be! This 2-day course is a brief introduction to the philosophy and practice of traditional Thai massage. Students will learn a selection of basic Thai massage techniques in the form of a 45-60 minute massage! This class is for couples and individuals interested in exploring culture and traditions of traditional Thai healing, or for existing practitioners who are interested in blending some Thai into their professional repertoire. Students will have plenty of time to practice 1-on-1 in a supportive environment. This Institute allows its students to return to repeat courses for free as interns, as many times as they want, at no extra cost, as long as there is space for interns! Internships are considered an invaluable opportunity and part of the learning process, as it allows students to repetitively see, hear and experience the foundational instruction as much as necessary! Read more about the Free Internship Program! Checks, Money Orders, Visa, Mastercard, Discover and Amex accepted. Prices do not include HI Tax of 4.166%. Processing fee for credit cards of 3.99%. Beginning Thai? There's a few ways to get started! Are these classes approved for Continuing Education by the NCBTMB? 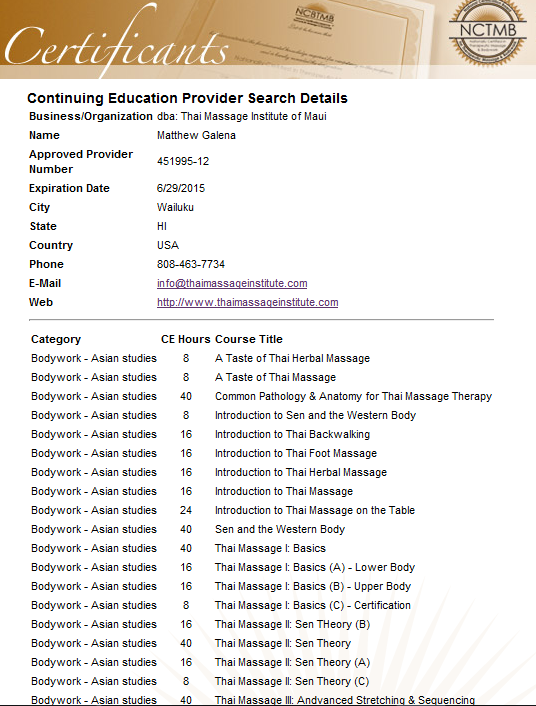 The Thai Massage Institute of Maui has been approved as a provider for CEs by the National Certification Board of Therapeutic Massage & Bodywork! >> Click here for a quick view of our NCBTMB approved classes page! What are the "internship" opportunities? These massage classes follow the traditions of its Thai lineage, including allowing students who have completed a course may attend that same course again as many times as they want, at no extra cost, as long as there is space for interns! Internships are considered an invaluable opportunity and part of the learning process, as it allows students to see, hear and experience foundational instruction repeatedly to hone their understanding. Ideally, in time this small school, like others, will grow large enough to have a daily clinic of supervised intern students, who perform and observe massage treatments as part of their long-term training! Read more about the Free Internship Program.